“Andrew Cawley sent us his Wrestlers portfolio as a submission, and in an instant we were in agreement to run it. We haven’t seen such portraits of Scots wrestlers in recent times, if at all, and barely know how the pro-wrestling scene works and operates. That is how Andrew began, seeing a poster, wanting to find out more, and we’re glad he did. Here, in a folio from his extensive project he shares his portraits of those Scots for whom pro-wrestling is their love…” – Jeremy Sutton-Hibbert. ©Andrew Cawley 2014, all rights reserved. The Wrestlers, by Andrew Cawley. “I began photographing The Wrestlers, in 2009. Walking home one night on Sauchiehall Street, in Glasgow, I saw a poster for a Scottish pro-wrestling event and immediately knew what great potential it had for a documentary project. Initially what appealed to me were the obvious themes of the subject – the action, excitement, colour, the characters, and the atmosphere of the events. But soon, what I found interesting, and what I wanted to attempt to capture, was the people behind their wrestling characters. When the wrestlers step into the ring, they become a made-up, fantasised, character. But backstage, they are simply everyday people. The fans only see the wrestling persona – but I was able to see both sides of the wrestlers – the character in the ring, and the real person, backstage. And I was much more interested in taking photographs backstage, rather than the actual wrestling in the ring. I specifically didn’t really want to be taking the usual wrestling action shots – I was much more interested in the unseen – glimpses of the wrestlers out of character, that we don’t see – the person behind the mask. This wasn’t easy at first – they could be quite guarded and a little suspicious of me. But gradually I managed to capture a few images of them, out of character, as they prepared to go in to the ring. A major part of the wrestling is the fans – they really are the heart and soul of it. So I also wanted to capture their love and passion for the sport too. So again, rather than photographing what was going on in the ring, I would spend a lot of my time with my back to the ring, photographing the fans, literally going wild. And having your back to the ring isn’t really the ideal position to be in when there are 15 stone, sweaty men being thrown over the ropes! But, hopefully I conveyed the passion the fans have for their sport. They are people who are bored of the same old reality tv shows, and celebrity culture which bombards our lives – this is pure, raw, live entertainment for them. The first wrestling events I went to, were held in small Glasgow venues, like the Queen Margaret Union, Bellahouston Leisure Centre, and Govan Town Hall. These venues are a far cry from the huge glitzy arenas you see on U.S. tv of the American wrestling – and this is exactly what attracted me even more to the project. I found it fascinating to see this sport, being played out at local venues, organised and attended by fans who are obsessed wrestling. It is grassroots wrestling – in Scotland. And the sheer Scottishness of it is brilliant too. The typical Glaswegian banter between the wrestlers and fans is hilarious. With myself not really being a true wrestling fan, I found this was something I could appreciate and identify with. In those early days of attending events, crowd numbers could be very low – sometimes only 50 people may turn up. Nowadays since it has evolved into ICW (Insane Championship Wrestling), it’s popularity has spread like wild fire, with a massive online and social media following, and all events selling out, at even bigger venues. It’s been great to see them grow, and I’m happy for their success. When I started there was only one other photographer taking pictures of them – now at their events there can be several, along with videographers – there has now been a BBC tv documentary made about them. At this point I was happy to call it a day with the project, and exhibit the work. 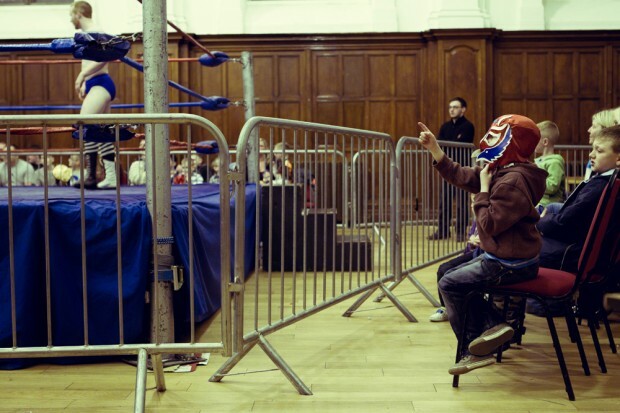 The wrestlers and their fans made for a great documentary project – it offered a fascinating glimpse into a Scottish subculture, and provided plenty of bold images, which I hope does their love of wrestling, justice.” – Andrew Cawley. To see more work by Andrew Cawley visit his website, or send him a message on Twitter!